Joshua Tree National Park is undoubtedly the main attraction in the California High Desert, bringing in 3 million visitors a year. We know it’s one of the reasons you’re interested in Desert Reset. After all, it’s why we live here, too! And we’re obsessed with “The Park,” so we’ve devoted a Wilderness page to it. But there are some lesser known hidden jewels and one-of-a-kind attractions in the area not to be overlooked. Slip away from the retreat and enjoy dinner at Pappy and Harriet’s or spend a day after your retreat luxuriating in sublime Palm Springs. You’ll soon undersand why the California desert is the “it” place to be right now. Pioneertown was built in 1946 by a group of Hollywood actors, most notably Gene Autry and Roy Rogers, who dreamed of creating an Old West movie set that was actually livable. They developed the town for themselves and other actors and crew members to live in while filming. 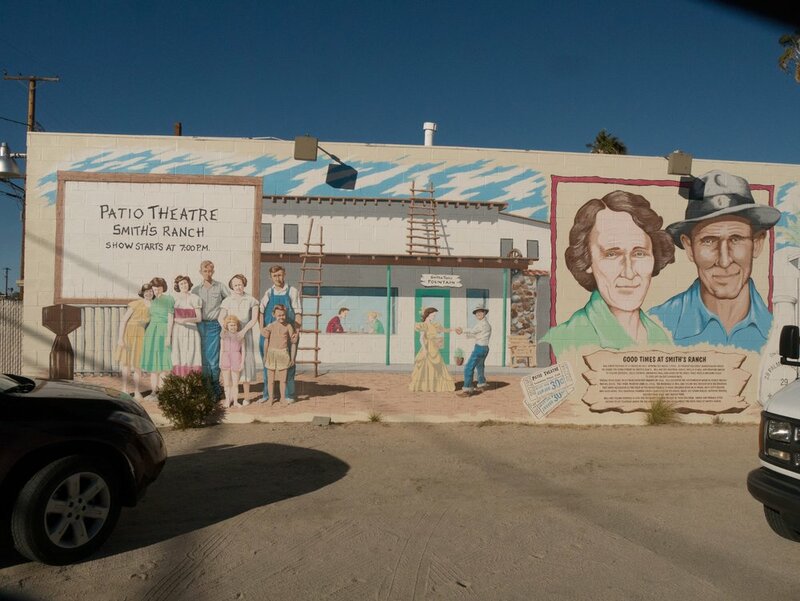 A number of Westerns were filmed here, including “The Cisco Kid” and it was the backdrop for more than 50 films and television shows in the 1940s and ‘50s. Pioneertown is now a unique experience for guests, and it is still a working town. Mane Street has a frontier stable, saloon, jail, ice cream parlor, bowling alley, shops, and motel. The most happening place by far is Pappy and Harriet’s Pioneertown Palace, which is renowned for its excellent live music (Robert Plant, Paul McCartney, and Modest Mouse have played here). This must-see desert find also serves up wonderful food with a few plant-based options, too. One of the most surreal stops on your tour of Joshua Tree. Located in an isolated area on the outskirts of town, the Noah Purifoy Outdoor Museum is an 7.5 acre open field of "Assemblage" art (or “Junk” art) consisting of sculptures by the late artist Noah Purifoy (1917-2004). Purifoy made unique art installations from discarded everyday objects such as televisions, barbed wire, tires, and even toilets. Many artists, academics, and critics regard the late Noah Purifoy as one of the most renowned American sculptors who worked in assemblage art. Purifoy was the first African American to enroll in Chouinard Art Institute (now CalArts) as a full-time student and earned his BFA in 1956, just before his fortieth birthday. He left Los Angeles when he could no longer afford it and made his home in Joshua Tree. Purifoy famously said, “I do not wish to be an artist, I only wish that art enables me to be.” And we’re all the richer for it. The museum is free and open during daylight hours. Desert Reset offers participants their own unique Tibetan bowl soundbath, but who could blame you for wanting to experience a soundbath in the most unusual structure, with the most surreal story. 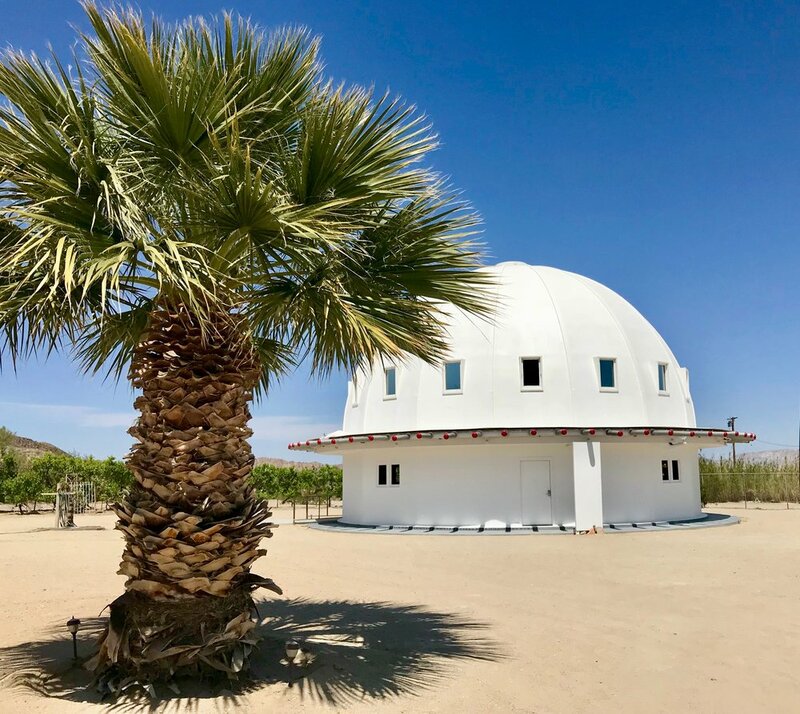 The Integratron is a 38-foot tall, 55-foot diameter structure designed by Aeronautical Engineer and Ufologist George Van Tassel. Van Tassel claimed the Integratron was capable of rejuvenation, anti-gravity and time travel. He built the structure based on the design of Moses' Tabernacle and the science of Nikola Tesla (with whom he belived he was able to communicate with in the afterlife). The plans were given to him by extraterrestrials from the planet Venus. Van Tassel claims that he was invited aboard a Venusian spaceship at Giant Rock (see below) and given detailed instructions on how to create a machine that could rejuvenate living cell tissues. The domed structure was built without nails over a period of 34 years and erected in 1959. It was financed by donations, including funds from his friend Howard Hughes. Unfortunately, Tassel suffered a heart attack before its completion, giving rise to many conspiracy theories. (Read about Giant Rock below, which is a part of the Integratron’s fascinating history.) The Integratron is the only all-wood, acoustically perfect sound chamber in the U.S., and is recognized as a historical structure. The Integratron’s Signature Experience is "kindergarten naptime for grown ups in a sound sphere.” All Sound Baths are 60-minute sessions that consist of 25 minutes of crystal bowls played live. Open by appointment only Wednesday through Monday, $35/person (weekdays) $40/person (weekends & holidays). Closed mid-summer. Giant Rock is the largest free standing boulder in the world, covering 5,800 square feet of ground. It’s actually the beginning far-out story of the Integratron (See above). For thousands of years, Native Americans considered this large boulder to be sacred, being the spiritual site for ceremonies and prophecy. It received its distinction because of George Van Tassel (of Integratron fame) and the UFO Conventions he held there. Van Tassel was first introduced to Giant Rock by Frank Critzer, a German immigrant who had come to the desert in the 1930’s for prospecting. Critzer lived in a room he had dug out underneath Giant Rock. Some thought he was a brilliant visionary, others just thought of him as a crazy loner. Critzer was a radio enthusiast and placed an antenna on top of Giant Rock, but due to his German origin, he was suspected of being a World War II spy. In 1942, police raided his room and legend has it that when the police tried to extricate him by shooting tear gas canisters into his cave, one accidentally ignited a small store of explosives (for mining) and killed him. Critzer was not a spy, just a loner living under a rock. In 1947, Van Tassel moved to Giant Rock with his wife and three daughters. They built a small cafe next to Giant Rock, opened an airport, and began holding popular UFO conventions known as the “Giant Rock Spacecraft Conventions” on his property for over 20 years to help raise money for the Integron’s construction. By 1959 more than 11,000 people were attending the UFO conventions. In February 2000, Giant Rock fractured in two, revealing an interior of white granite. Spiritual leader Shri Naath Devi interpreted the break in a positive light, saying “the Mother had opened her arms to us, cracking open her heart for the whole world to see.” Today Giant Rock is filled with graffitti, but still retains its rich, albiet unbelievable, history. It’s well worth the bumpy ride it takes to get there. Joshua Tree, CA is a unique little town, strongly protected by locals who have made sure the town retains its old west charm. You won’t find any big stores, fast food restaurants, or apartment buildings here. Every store is a mom and pop type of place. Because the residents have kept the town’s integrity, it’s pretty much the same as it was in the 60s. Joshua Tree is home to numerous and even world-famous artists and musicians. Between the farmers market, art events and galleries, funky shops, natural food stores, coffee shops, and live music venues, and the “World Famous Crochet Museum,” a unique energy and creative spirit abounds. Go for dinner at Natural Sisters Cafe (many plant-based options) and then enjoy a stroll in this charming town. One of the last drive-ins in the country is right here in the High Desert. We couldn’t blame you if you snuck away to catch a double-feature under the stars at Smith’s Ranch drive-in movie theatre. This place is the real deal. Located in Twentynine Palms (a 15-minute drive), and for only $5 cash per person, you can have a real nostalgic evening, complete with snacks. Tune your FM radio to pick up the sound, sprawl out on the hood of your car and enjoy the show. The drive-in is open Thursday through Sunday, with new movies every Friday. In the ‘60s and ’70s musicians like Donovan, Keith Richards, and Gram Parsons often visited Joshua Tree. In 1973, on one fateful visit to Joshua Tree, Parsons overdosed and died in his room at the Joshua Tree Inn. Since then, fans make pilgrimages to the inn to stay in room 8 where he died, and to visit his shrine. If you’re a fan, you don’t want to miss this. Why not double your fun and stay in room 8 and participate in Desert Reset retreat as a commuter! Well-known for its beautiful weather and modern elements, Palm Springs is known to the Joshua Tree locals as “downstairs.” Just a dime’s roll straight down the mountain 30 minutes from the retreat and you’re in a different world. 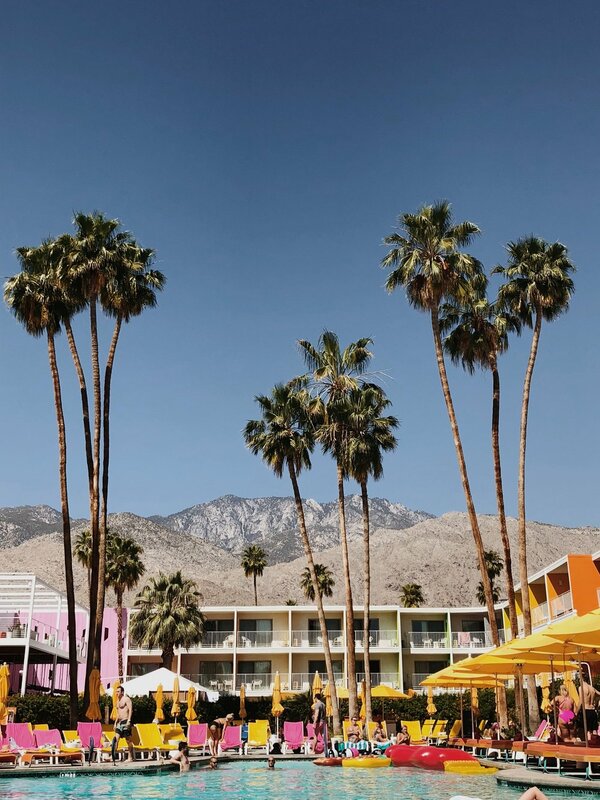 Palm Springs was once the secret getaway for movie stars like Frank Sinatra, Dean Martin, and Elizabeth Taylor, but with its hip cool vibe, it has become a world vacation destination for anyone who wants to experience a laid-back luxurious getaway. With its warm days and balmy nights, Palm Springs welcomes visitors to its chic hotels, superb shopping, and world-class restaurants and spas with its small-town-friendly open arms. Home to one of the largest collections of Midcentury Modern architecture in the world and 360 days of sunshine make this a vibrant city. If you can be pulled away from the Palm Springs lifestyle for a few hours, may we suggest soaring to the top of Mount San Jacinto on the world famous Palm Springs Aerial Tramway? The tram whisks you up into the mountains, ascending about 5,800 feet in 10 minutes. The car, suspended by cables, rotates as it climbs, offering mountain views. At the top, it’s about 35 degrees cooler. One visionary man looked up the mountain from a sweltering Palm Springs street and said, “I wish I could get up there quickly where it’s cooler.” And then he built a way to do it. At the top, you’ll find a fine-dining restaurant, a cafeteria, a bar as well as a gift shop and hiking trails. A round trip costs $25.95 for adults and $16.95 for children ages three to 10. If you’re lucky to be in Palm Springs on a Thursday evening, stroll the year round Villagefest, a street fair featuring arts, crafts, food, and entertainment. For those spending extra days in Palm Springs, just 10-minutes down the highway, you’ll find Morongo Casino and Resort next to Cabazon Premium Outlets. New cute yoga pants, anyone?